With a hand and wrist surgery clinic at the University Hospital of South Manchester, it’s high time we delved into the history of Wythenshawe Hospital to learn about the heritage. Wythenshawe Hospital is built on the site of Baguley Sanatorium. The Sanatorium opened on the 4 October 1902 to lead the way in the fight against a huge tuberculosis spike in the United Kingdom. It opened its doors with the sole purpose of combating a severely urgent health problem. How urgent? Well, earlier that year, an International Conference on Tuberculosis was held in Berlin to bring world leaders together and discuss a strategic approach to the outbreak. The result of the Conference was a continental campaign to dampen the prevalence of TB. Prior to the opening of the Sanatorium, the disease accounted for around 12% of the deaths per annum in Manchester, claiming well over 2,000 lives per year during the late 1800s. What is Tuberculosis? – An infectious disease caused by the bacterium myobacterium tuberculosis, which is generally contracted by breathing in the bacterium or by consuming contaminated food. TB generally affects the lungs, and classic symptoms include a chronic cough producing blood-containing sputum, fever, night sweats and weight loss. Old records describe tell of stable-style doors fitted at either end of each ward, with upper and lower sections of the doors able to open separately. These doors were kept open at all possible times, only the most adverse of weather conditions would see them shut. The purpose of this was to ventilate the ward with fresh air as much as possible. Beds were protected from precipitation by rubber sheets that acted as a canopy over each patient. Baguley Sanatorium was further expanded in the summer of 1914, a date that incidentally marks the beginning of the First World War. This expansion saw the addition of two new wards bringing the total to to 7, and accommodation for 150 further patients. As we enter into the early 1920s records indicate that the number of beds had increased to well over 300. As historians dove deeper into information from this time, they also uncovered that there were nine patients whom had been at the Sanatorium for over five years. Due to the long periods in which patients were held at the Sanatorium, occupational therapy became an essential part of the overall treatment process. Handicraft programmes were introduced for male patients towards the back end of the 1920s, with similar female classes established a handful of years later. Patient welfare remained a point of focus in the early 1930s with the establishment of the San Toy magazine, inviting patients to submit articles and swap morale boosting stories. Later that decade, every patient’s bed was fitted with headphones so that they could tune in to radio programmes. The 30s and early 40s really were a time of big change in terms of both the size of the Sanatorium and its overall function. The first operating theatre was opened during this time along with a, then, state of the art nurses home than was the envy of hospitals across the United Kingdom. It was towards the end of the 1930s that the concept of an all encompassing Wythenshawe Hospital was first discussed. However the Second World War was looming at this point in time and the premises was resigned to a more radical purpose – Baguley Sanatorium was primed and ready to house civilian war casualties from around the area as an EMS (Emegency Medical Services) Hospital. Needs must. It was here that burned soldiers were treated, and in true Mancunian fashion, Baguley pioneered some of the very first instances of what we now commonly know to be plastic surgery and reconstruction. Later on down the timeline, the Plastic Surgery Unit fully transferred to a purpose built unit at Withington Hospital – 1969 to be exact. 1948 was a historic year in British medicine as, of course, the then Health Secretary Aneurin Bevan MP launched the NHS at Park Hospital not too far from Wythenshawe (now known as Trafford General Hospital.) It was clear at this point that Baguley Sanatorium required a radical and time-sensitive restoration, bringing the facilities up to the required level to match the upwards trajectory of the NHS plan. At the turn of the half-century Baguley had finished treatment for its final wave of afflicted war heroes. 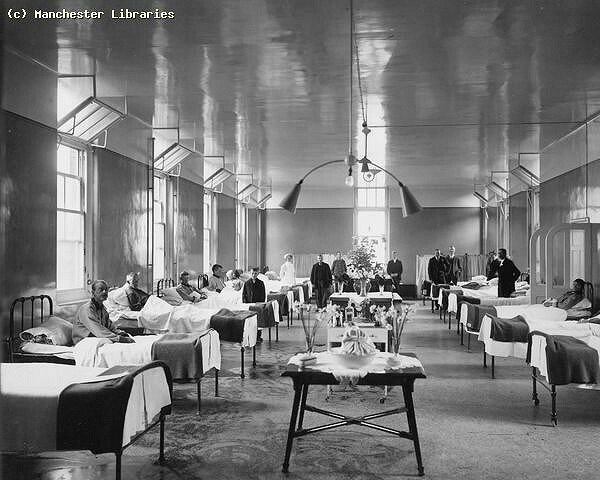 Renovation work was well underway, and while Baguley continued to operate primarily as a chest hospital, further wards were created including a children’s Ear, Nose & Throat ward. 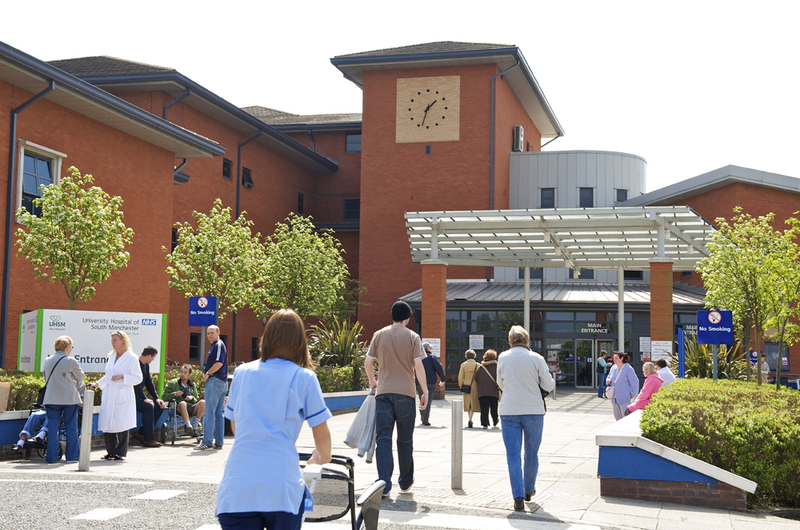 Now being run by the South Manchester Hospital Management Committee, Baguley Hospital began to gain an extremely positive reputation for itself. 1955’s Ministry of Health, then headed up by Robin Turton MP, included Wythenshawe in a list detailing the first wave of new hospitals to be built under the National Health Service. The original plan was set out to demolish the Second World War EMS facility and build an entirely new hospital on the same site, but these plans came into a roadblock in the form of the Manchester Regional Hopsital Board. Years of back and forth followed as the relevant parties sought to come together under one true vision – and it was eventually decided that a 350-bed hospital would be built on land north of the Baguley Hospital campus. This would be the initial Wythenshawe Hospital, which also retained the EMA facilities. The huts would be demolished in 1994, just under 40 years later. A Maternity Hospital was opened in 1965 to the tune of £750,000, which in 2018 money inflates to well over £100,000,000. Wythenshawe Hospital grew from strength to strength as a general hospital, and by the late 60s it possessed the following. The 1970s and 1980s saw Wythenshawe Hospital continue its evolution into one of the busiest and highly-rated hospitals in the North West. Perhaps, nothing was more indicative of the success than the first ever heart transplant being performed by surgeons at Wythenshawe in 1987. In 1993, Princess Margaret opened a dedicated transplant centre at the Hospital. Wythenshawe Hospital, Withington Hospital and the Christie became self-governing trusts in 1994 as part of major NHS reforms. Prior to that they were run by the South Manchester Health Authority, and this was split into two trusts: the South Manchester University Hopsitals NHS Trust, and the Christie NHS Trust. By 1995 the Trust was capable of treating more than 7,500 in-patients and 300,000 outpatients. On top of that, it could manage 90,000 A&E cases across the course of a year; records show that over 5,500 people were employed by the Trust at this point. This century has seen the establishment of The North West Lung Centre, an homage to the foundations that the Hospital has been built on. Here’s a list of some of the biggest recent additions. Struggling with hand or wrist pain? Miss Ladan Hajipour is a specialist hand and wrist surgeon, and would be happy to receive your enquiry. Fill in the contact form below if you need to.